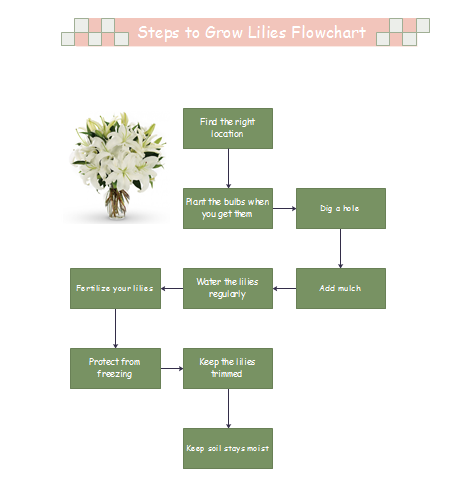 Grow lilies steps flowchart will show you clearly how to grow lilies steps by steps. This passage will be of great help if you want to grow lilies for someone you love. Lily flowers are valued for their very showy and fragrant flowers. Many people like lilies but do not really know how to grow lilies. Now, we are going to show you clearly how to grow lilies steps by steps. Though lilies look like they'd be fussy plants, they are actually very easy to grow. They're not particular about soil type or pH and they grow well in full sun, part sun, dappled shade and even light shade. Ideally plant lilies bulbs in early autumn, although bulbs can be planted until spring. Lilies can also be forced into flower for an indoor display. Bulbs commonly sold for forcing include Asiatic hybrids, L. auratum, L. longiflorum and L.speciosum. These bulbs will have been kept in a cool environment in order to flower without natural winter chill being necessary. Forcing involves bringing the pot into the warmth of the house or heated greenhouse, for flowering around six weeks after planting. Moreover, learn how to grow healthy plants and how to grow roses here. Ideally, pick a spot in your garden with good drainage and plenty of sunlight. To find a good drainage location, find the spot in your garden that dries out the quickest after a pour of rain. If there is no obvious location, plant your lilies on a slope, and let gravity take care of your drainage. Loosen the soil to a depth of 12 to 15 inches. The deep planting encourages the developing stem to send out roots to help stabilize the plant and perhaps eliminate the need for staking. Lilies like the sun, but their bulbs prefer to stay cool during the summer. Digging a hole about 4 to 6 inches (10 to 15cm) deep, and keep in mind that deeper is better - not only will the bulbs be protected from potentially hot summers, it will also provide good support for the stems. Lilies generally don't need a lot of water, so only water it when necessary. Trumpets, and Orienpets flourish in hot, dry climates, as long as they have enough water up to flowering time. Orientals need watering during the summer, as they do not blossom until August. Adding mulch in the summer helps keep the bulbs cool, and so lowers the need for additional watering. When they first push up shoots, add a little well-balanced fertilizer. Lilies are fairly hardy, and don't require a lot of fertilizer. In fact, too much nitrogen can result in weak stems, and in hot, wet climates can also result in bulb rot. For optimal results, select a fertilizer that aids in potato growing. Fertilize when first sprouting, and again about a month later. During the flowering season, trim the spent blooms, keeping at least 2/3s of the stem intact to keep your strong and healthy for years to come. Last but not least, when you make the home plan, office layout, house plan, building plan and garden design, it is quite important to consider a question: whether you leave enough space for the lilies in your house, office and buildings, etc.